CHELSEA — Here's hoping they can hit the high note. Some of Broadway's top stars will put on a night of songs and performances honoring High Line co-founder Robert Hammond, complete with a musical ode to the city's elevated park and a theatrical performance of interviews with his colleagues, friends and fans of his park. The Civilians theater company — a Brooklyn-based company — will fete Hammond at their annual spring benefit on Monday at the Highline Ballroom, 431 W. 16th St. The troupe has named Hammond as their "Civilian of the Year" for his work on the High Line, and have put together a unique "investigative theater" piece that shines a light on his life and the gestation of the park. Amanda Burden, the Director of New York City Department of City Planning, attends the groundbreaking for the Whitney Museum's new building on Gansevoort Street on May 24, 2011. 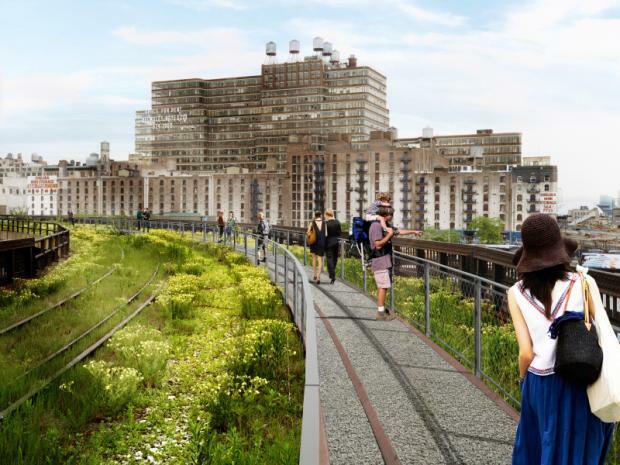 Hammond founded Friends of the High Line, the organizing body behind the critically-acclaimed park, in 1999 with Joshua David. Seventeen actors will perform excerpts of interviews that the theater company creative director conducted with Hammond's friends, colleagues and visitors to the High Line. "It's all people talking about Robert," said Steve Cosson, artistic director for the Civilians. "It's kind of a mini-'This is Your Life' for Robert and the High Line." The event will feature three original songs by composer Michael Friedman, whose award-winning musical "Bloody Bloody Andrew Jackson" leaped to Broadway in 2010. One of the songs will be performed by an actress playing Amanda Burden, the Director of the Department of City Planning, who worked with Hammond to establish the High Line. The cast is filled with Civilian regulars and other Broadway heavyweights, including Tony Award nominees John Ellison Conlee and Daniel Jenkins. "This is the first year we’ve instituted a Civilian of the Year award as part of our benefit," said Cosson. "We wanted to honor someone as a civilian and a person of New York who has made an outstanding contribution to the city, who's done something remarkable." Tickets for the event range from $75 for admission to $250 for a VIP spot with table service and hors d'oeuvres platters.